This weekly television show follows the Intelligence Unit of the Chicago Police Department, which deals with major crimes like drug trafficking and high-profile murders. Sgt. Hank Voight — a tough boss who doesn’t mind bending the rules a little in the pursuit of justice — heads the unit’s elite team. Sergeant Voight’s motto is “We don’t ask for permission, we ask for forgiveness”. Sergeant Voight is a classic “Noble Causer” as defined by Punch (2009). He is committed to the ends of policing, he believes in his role as a crime stopper. He is so committed to the end means of policing, that he is willing to employ deviant methods to achieve those ends. My irritation is not about the Noble Cause tendencies of Sergeant Voight, it is of the fact that at the end of every episode he is praised for his “good work”. He is not doing good work in my opinion. He is reinforcing the notion that police are “above the law”, and need not obey policies and laws as long as they apprehend someone at the end of the day. Furthermore, Voight is the supervisor of all of the other police men and women on this show, and he encourages them to take whatever measures are necessary in order to apprehend and charge any offender. The core values of a policing agency are completely ignored by this unit: fairness, trustworthiness and professionalism are not evident in any area of this television depiction of a police organization. Voight is constantly under investigation from Internal Affairs (IA), but always manages to avoid sanctions because of the “results” he produces. Naturally, Voight always defends his officers when they are investigated by IA as well, calling them “good police” too many times to count throughout the season. Voight is glorifying the term “good police” as an officer who solves cases and apprehends dangerous individuals. What he does not address is the psychological harming intimidation tactics, as well the constant use of unnecessary physical force that these “good police” use. There is no line nor distinction between corrupt and uncorrupt in this show, because all of the officers exhibit corrupt behaviour that is ultimately praised. A common underlying theme conveyed through media representations of police wrongdoing center on the understanding that deviance and “bending the rules” is acceptable as long as criminals are caught and locked up. As a Criminology student, I despise this rationalization. I firmly believe in the due process model. An individual is innocent until proven guilty in the court of law, and it is not the police department’s job to take on a “judge and jury” role. I become weary of the fact that millions of individuals exposure to policing rests on weekly television shows such as Chicago PD. If this is the education that society is receiving about policing, how is the public expected to hold any police organizations accountable any of their actions besides apprehending “criminals”? 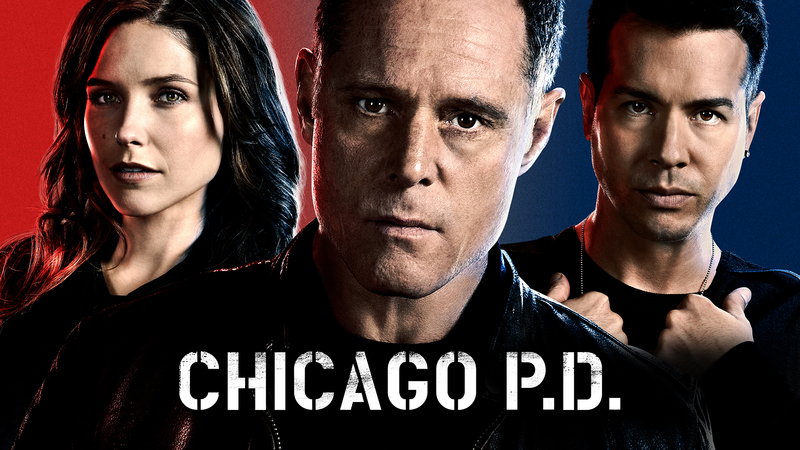 Although I recognize that fiction is not always trying to represent reality, I believe Chicago PD is attempting to recreate incidents and relationships within a police precinct. Naturally, the paperwork portion of an officer’s job would not make for thrilling television. So the realistically infrequent cases of kidnappings, million dollar drug busts, and serial killing are incorporated into every weekly episode. Because this television show is depicted as a “typical” police organization, public perceptions about the deviant practices police as well as their abuse of authority become normalized. This should be worrisome, as these characteristics have potential for run-off into the real world policing which is not only possible, but also admired. Punch, M. (2009). What is corruption? In Police Corruption: Deviance, Accountability and Reform in Policing (pp. 18-52). Portland: Willian Publishing. Police Use of Body Mounted Cameras, Yea or Nay? Body cameras and their use within the policing sector is a topic that will most likely bring more legitimacy to policing operations and regular work; however questions of privacy and officer freedom are areas of concern. It only due to fairly recent technological advancements that such an incredible feat can be produced: watching the watchers from their point of view. Generally a body camera is a small, mountable camera that records audio and visual within a varying scope depending on the make and model. The company that made its name in mountable cameras is GoPro and their ‘Hero’ series (http://gopro.com/), starting at a mere $129.99 ranging to upwards of $499.99. These cameras are small and have a rigid housing that is waterproof (up to 40m) and has HD capabilities for whatever one may put it through. Other companies that hope to make a name for themselves in the policing side of mountable cameras are Vievu (http://www.vievu.com/), and the international company that made its name in non-lethal alternatives, Taser International (http://www.taser.com/). Both Vievu and Taser have two cameras that are being marketed; Vievu ‘Straight Shooter 25’ (starting at $199.99) and the upgraded version ‘Solution’ ($399.99-499.99); Taser int. has two diverse cameras, one mountable ‘Axon’ ($399.99) and the other even smaller ‘Axon Flex’ that can be mounted on glasses, hats or cruisers but also has a bigger price tag of $599.99. The Main differences are Vievu and Taser requiring a monthly fee for law enforcement for memberships of secure storage, whereas GoPro only supply the camera and accessories. The choice is not forced, but up to the discretion of the individual police force upon which device is to be purchased. One organization that took it upon themselves to implement mounted body cameras was the Vancouver Police Department during the court ordered disbanding of the ‘tent city’ in Oppenheimer Park in 2014. The V.P.D. bought and mounted eight GoPro cameras with chest mounts to get the perspective of the officers as they aided in the court order (Vancouver Sun, 2014). One of the main reasons behind the cameras was because of many members of the public fearing police brutality and questionable practices, but with the video evidence, if any misdeeds were to occur, more evidence would be present opposed to a video uploaded onto YouTube showing the result of an interaction. The reasoning behind much of the push for mounted cameras is to get more of the view of the officer and what leads up to an interaction because most complaints pertaining to the police go unrecorded, while the main police discrepancies come through the viewing of an amateur video on the internet such as the cases of Robert Dziekanski or Sammy Yatim (Goldsmith, 2010). With the main goal of ensuring integrity, this new form of officer perspective will hopefully play an important role in the future. If body cameras had been implemented to all officers, both in Canada and the US, incidences like the Ferguson shooting of Michael Brown and the 2nd Degree murder charge for Delta’s Constable Jordan MacWilliams could have been used in the courts as evidence. The case of Jordan MacWilliams did not lead to a nationwide outcry as Ferguson, but it did lead to police forces in BC to questioning the charges laid for an officer doing their duty (CBC, 2014). Ferguson however, sparked disintegration of the already strenuous relationship between the public and police (NBC, 2014), so the video evidence of a body camera might have aided in the ruling of the officer involved, but may not have had too great of an effect on the public conception of police practices. However what cameras will affect are the actions and interactions officers and members of the public, both in what they do, what they say or not say due to the fact that on the other end of the camera ‘someone could be watching’. With the cameras every present, this creates a mesh of both a Panopticon and Synopticon (Goldsmith, 2010). The police (the few) oversee the public (the many), this being a Panopticon, and with the public reviewing the actions of the police, a Synopticon, then the situation is converted into a mesh between both because of the cameras on the perspectives of the public and the police. However, with the Panopticon (few watching the many) perspective (Goldsmith, 2010) and the everyday body camera use, the personal privacy and officer actions such as discretion could often be compromised. Much of the police assemblage does not involve just crime prevention, but also community policing (Brodeur, 2010), and if every interaction were recorded, conversations of private matters, such as familial situations, questionable morals or even everyday occurrences are recorded and some of the information may not have meant to go past the people involved. The other side is police discretion and restriction of their freedom of judgment; what an officer might choose to do may not look good in the eyes of the Criminal Code, such as if petty crimes being left to discretion. However, cases of mass demonstrations and larger micro-crisis (Brodeur, 2010) the use of body cameras may be of great importance not only in keeping an officer’s integrity intact but also used as evidence against, or for, a member of the public in front of the courts. I believe that cameras should be used with discretion of the police department in specific event or areas/populations being patrolled to ensure fairness in their actions. Brodeur, J.-P. (2010). The Police Assemblage. In The Policing Web (pp. 17–42). New York: Oxford University Press. Should Body Cameras be Accepted or Rejected in Canada? Are the ‘new’ body cameras really going to solve police accountability? Or lead to more problems? We must first begin with understanding cameras without even mentioning police officers. There are cameras in grocery stores, big malls, parking lots, streets, offices, and many other public facilities, but what it really comes down to is; does that really stop crime from happening? No! Crime is still there, people will still steal from malls, or rob cars in parking lots. Having a camera there will not change the outcome of an individual’s actus reas when their mind has already made up the decision to commit a crime. The only thing that really changes is a criminal’s way to go about the criminal activity without getting caught. Now I’m not saying having those cameras there are useless; they do provide safety, and protection for the public, and the police. The point here is that they do not stop crime from happening; it is still there regardless. Really the only difference is now one can visibly see someone stealing or committing a criminal act. The whole point of having police officers is to create a safe community. When we look at measuring safety we look at the dimensions of victim harm, and the rate of crime. To me personally if an individual’s mens rea is there, then really a camera won’t change the outcome of the act. A perfect example to really show what I am trying to get at is the ‘Stanford Prison Experiment’. This experiment had normal healthy young males who prior did not have any record of deviance, be either a guard or a prison inmate at random. Now clearly, the prisoners knew there were cameras, or at least were being watched, while the guards also knew there were cameras. That did not stop them from treating inmates inhumanly. What this means is even ‘real’ police officers will still be corrupt if that is truly where their mindset is. They will just be more careful. We can even hypothesis that new types of corruption can be created from this, like for example ‘accidently’ deleting recordings or a camera ‘breaking’ and so forth. The blue wall can also come into effect here, where there can be chances of officers covering for other officers, even with the no deleting recordings policy. Corruption exists in many ways, and those who try to get away with deception, usually find a way around the system. It has happened in the past, and can very well do so in the future. The publics uproar about police accountability is really only based on three main cases, Ian Tomlinson, Robert Dziekanski, and Ferguson; two of which did not even occur in Canada. Yes, I do agree justice should be done, but that does not mean every Police officer in Canada should have their privacy invaded. If we zoom into the Dziekanski case, maybe better cameras should have been in the airport instead of blaming the whole police community of the acts of a few correction officers. The rotten apples should not spoil the rest of the barrel by making them undergo a big economical system change. Would anyone like to be on camera throughout his or her whole shift, especially for a 12-hour shift (common hours for police officers). Would a secretary at work like being filmed they’re whole shift, or would teachers like having their classroom being recorded all day. I would assume no they would not, but yet workplace, and classroom incidents are also common situations where body figures misuse their authority in Canada (Moulden et al, 2010). Coming back to cameras, companies like Axon, and VieVu have already started making products for this new police equipment. According to the TASER’s website the ‘Axon’ body camera is designed to record easily in a wide-angle view while being light weight, and show clear footage (TASER, 2014). The police officer would wear it on their uniform and anytime they would be interaction with a civilian they would simply slide the camera lens off. Once the interaction was over they would slide the lens cover back on. They conclude with showing that the rate of complaints have fallen 87.5%. What I would like the reader to note here is that the study they show here is in only one agency of Rialto, CA which it directly says is a small town. Why have they not shown a study of a big town? We must be critical and note why there are no other agency studies posted on their website? Is it because the other ones do not show improvement? Or did they simply only take the agency that showed to have the most improvement compared to any other agency. By doing this it automatically show improvement because they are ‘marketing’; this means that they are only showing what they want ‘buyers’ to see so they can make money. Another thing to note is the graphs they show fail to go in-depth about the range they are counting for complaints, and use of force. To the naked reader we have no idea what these numbers really mean. The cost for an average body camera is typically around $400. This does not even include the chargers, docks and other gadgets that also would need to be bought. Once the camera has recorded material on it, it can then be charged into the dock where it automatically uploads to evidence.com. The material here can be accessed by police administrative bodies, and usually held for up to 180 days directed by TASER, unless it is in need for evidence. Recordings are able to be watched by the officers, but are not able to be deleted, or modified once they are uploaded. Additionally I would like to inform the reader that from all my research I was not able to find any information about new facilities that would have to open to store the recordings, or new workers that would have to be employed to manage the recordings. Articles just talk about the body cameras; people need to realize that money is not only going to be put into the cameras, but there will be money needed in other areas as well. Body cameras having been first implemented in the U.S and have made their way to Canada now. Justice officials say that if the public has cameras, so should the police. The body cameras allow the officers to safely protect the public, while ensuring they’re own safety as well. Questions about officer reliability, and accountability are being answered after watching footage. Many civilians may not use force due to knowing it will all be filmed, and vice versa. The safety of both parties here can be potentially benefited. Police officers do not have to deal with as many lawsuits that also cost tax payer’s money. Also sometimes witnesses, or victims decide to later withdraw from a case, which can cause the case to have no evidence. With the cameras there will always be evidence for the court; this can be either good or bad depending on the victims life. Police may in fact come out on top after all the criticism that they have received throughout the years. Now the public will understand that the police officer could have been justified in they’re actions. In situations of police misconduct, the police would have full accountability in cases like these because even the courts would not be able to save them. The courts would never have to feel obliged to take a police officers report as the only evidence anymore, because now they would have footage. Justice officials in New York claim that body cameras are economically beneficial in saving the city millions of dollars in lawsuits every year, which would in the end pay for all of the cameras themselves (Lopez, 2015). The world of technology is always evolving, and with the dash cams just not being able to cut it anymore; body cameras may prove to be effective on their own. In Goldsmith’s article, he establishes that phone cameras, and the media are apart of the police organization now. Police having they’re own body cameras have evolved from that. Goldsmith would say that the police too should have they’re own cameras so that they can prove what maybe the public ‘filmer’ failed to record. Most civilians only start to record once an event begins to get ‘interesting’. 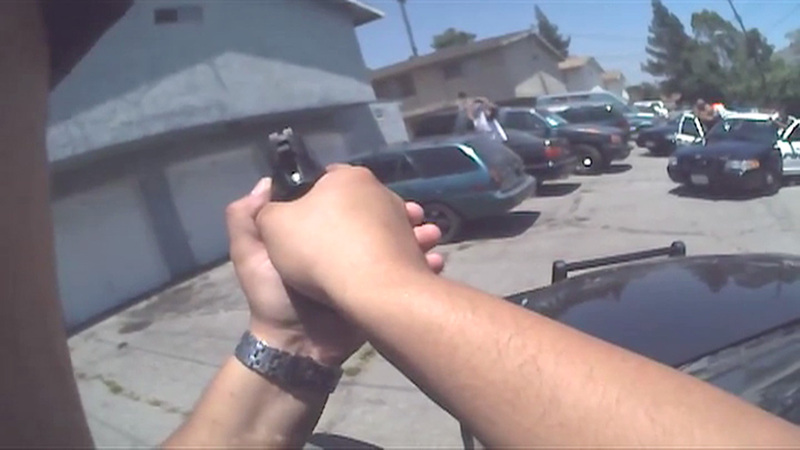 The police officers on the other hand would get the full footage, from beginning to end. He would claim that now accountability would go to whichever party is at true fault. This is a beneficial way for police officers to prove they’re innocence. Here is an video that allows viewers to see how Body Cameras are used and can be effective, and beneficial. I would just like to conclude with one last thing, we live in a ‘democracy’. This means everyone should get the opportunity to see all of the pros and cons, and then decide if we as a community want and need the cameras, since it is affecting everyone’s privacy. If citizens, and police officers all think body cameras are necessary in today’s age, then by all means that is what should happen. I want to leave the reader thinking with one incident I once heard a retired police officer say, “A young female was about to commit suicide by jumping off a bridge…. I sat with her for two hours, and continued talking until she finally decided that life had a lot more for her…this saved her life”. I personally think if the police officer was wearing a camera the female would not have opened up as she did, and possibly the police officer may have not been able to say everything he had to as well. Not every situation should be on film, there’s times when having a camera can be invasive, and create more drama then it really needs to be. As the reader, really ask yourself is this what you would like to see in the next couple of years? Moulden, H. M., Firestone, P., Kingston, D. A., & Wexler, A. F. (2010). A Description of Sexual Offending Committed by Canadian Teachers. Journal Of Child Sexual Abuse, 19(4), 403-418. Stroud, Matt. “The Big Problem With Police Body Cameras.” Bloomberg. 15 Jan. 2015. Web. 8 Feb. 2015. <http://www.bloomberg.com/news/articles/2015-01-15/police-body-camera-policies-wont-work-if-cops-dont-turn-cameras-on&gt;. With the emergence of smart phones and social media, most people now have the capacity to record and share any part of their daily lives with a larger and attentive audience. A ramification of this is the “new visibility” that the police are now subject to (Goldsmith, 2010), and the implications of accountability that stem from it. The body camera is a compelling and seemingly effective piece of technology that drastically changes how we view accountability measures, albeit still new and unproven to an extent. One device, currently at the forefront of the race, is the TASER AXON camera system. Evidence.com lists five steps in using the system for agencies that are interested in adopting it – collect, transfer, manage, retrieve, and share. Officers are able to record interactions via the body camera, which can be clipped onto their uniform, in any file format, then transfer and manage the security-protected files, later retrieve them with ease, and grant access to select others off of the secure cloud storage-like network. The TASER AXON Body Camera has a retail value of $399, but there are cameras that go for less and those that go for more. Several police agencies across the United States and Canada have taken to testing the waters of utilizing body cameras for policing purposes, perhaps as a reaction to occurrences of police brutality. A recent example would be the shooting of Michael Brown in Ferguson, Missouri and the events following, including outcries for police accountability by citizens. The RCMP is one organization that has researched body worn video devices for a half-decade and pilot tested them in New Brunswick in late 2013, stating that they seek to “[enhance] transparency as well as police and public safety,” and that is exactly what is offered by the devices from an accountability perspective. As cited in Goldsmith (2010, p. 922), Mann (2006) expresses that true transparency is achieved when an activity is recorded “by a participant in the activity,” rather than an outside observer with a smartphone camera, for instance. Body worn cameras also have other perceived advantages, in addition to heightened transparency. PERF, or The Police Executive Research Forum, is an organization based in Washington, DC that seeks to promote police professionalism. PERF has, through consultations with many police officials, explored the conveniences of body cameras as a catalyst for accountability in police agencies (Miller et all, 2014). They have gathered that relations between members of the public and the police are enhanced, as officers are able to better “resolve questions following an encounter” (p. 5). They also affirm that the cameras impede problems from developing early on, as professionalism is reinforced at both an individual level, through officer performance evaluation by video review, and at a larger level, with easier pinpointing of “structural problems within the department” (p. 6). With the identification of these problems, they are able to revisit and change protocols, for example (p. 8). Jennings et. all suggest that officers in general are supportive of the movement for body cameras, and feel that the cameras alone can improve citizen and officer behavior, as well as the behavior of their fellow officers (2014). In departing from a descriptive tone, I would like to address the controversy surrounding body cameras from my own perspective. First, as it is a relatively new phenomenon, there might be technological issues with the devices themselves at the outset (will the point of view be narrow enough for significant interactions to occur out of visibility? ), but these will be sorted out with the implementation and further expansion of body cameras as a standard, and by way of competing brands, as the video may indicate. I’d also like to address the idea that body cameras will interfere with the ability of officers to use discretion in daily policing activities. This might be applicable, for instance, where an officer could let an individual off with a warning for a trivial offense. I do not think discretion would be a power that would be severely limited as a consequence of body cameras, as the recordings would not be meticulously reviewed. This would just not be cost-efficient. Rather, the footage would be utilized for either evidential or developmental, training purposes, as Goldsmith implies (2010, p. 926). Hypothetically though, if the footage was to be watched on a day-to-day basis, and the officer was compelled to enforce the law completely thoroughly regardless of how unnecessarily harsh it would be, this would still not in any conceivable way removed discretion from the picture altogether. Rather, this where it would become apparent what laws should be re-written, reformed, or rescinded. It would put pressure on those in charge to “trigger political and administrative responses” (Goldsmith, 2010, p. 927). Lastly, as with any other occupation in the public sphere in today’s world, I do not think police officers should not expect absolute privacy. They especially should not cite this as a reason against body cameras, as they have specific duties, such as upholding the law despite whatever circumstances arise, that the average citizen does not. That being said, as Jennings (2014) proposes, police officers, in general, favor of the use of body cameras. When it comes to the issue of body cameras, it’s either competent but facultative officers, or competent officers bound by the restrictions that come with undisturbed accountability. Personally, I’d take the latter. Goldsmith, A. J. (2010). Policing’s new visibility. British journal of criminology. Jennings, W. G., Fridell, L. A., & Lynch, M. D. (2014). Cops and cameras: Officer perceptions of the use of body-worn cameras in law enforcement. Journal of Criminal Justice, 42(6), 549-556. Miller, Lindsay, Jessica Toliver, and Police Executive Research Forum. (2014). Implementing a Body-Worn Camera Program: Recommendations and Lessons Learned. Washington, DC: Office of Community Oriented Policing Services. A Political Crutch: Police-Worn Body Cameras. In the aftermath of the Mike Brown shooting in Ferguson, Missouri, The President of the United States, Barack Obama, promoted the use of body-worn cameras on police officers (CBC, 2014). He called for a national reform of police accountability, and promised the citizens of the United States that body worn cameras would help mend the precarious relationship between police departments and communities. However, Obama’s grandiose promises have led the public to believe that body cameras are a “win-win” situation. The common belief is that they could hold police accountable for their actions and also protect cops who are falsely accused of wrongdoing. This blog post challenges the assumption that police-worn body cameras increase police accountability and protect officers. 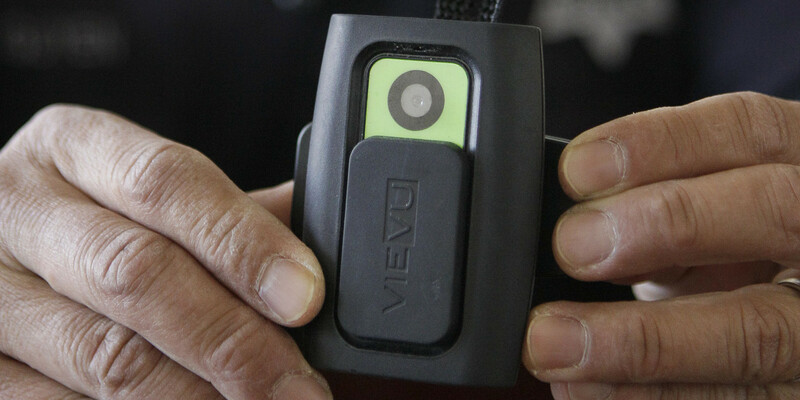 Body worn cameras record interactions between law-enforcement officials and civilians. Some battery-operated cameras can be attached to an officer’s vest or helmet; others, which look like thick pens, can be connected to the arms of specially designed glasses. The recorded footage goes to a secure online server or a cloud-storage system that can only be viewed by verified administrators. The original footage cannot be deleted without approval from an administrator, and individual police departments can set their own policies regarding the management of the footage, including how long the footage is stored. Developing official procedures to govern the use of cameras will be a tedious task. Officers should be required to have their cameras running during encounters with civilians, but will they be allowed to turn them off while they’re in their squad cars or engaging with informants who don’t want their identities revealed? Will civilians expectations of privacy be put in jeopardy by these cameras? Another concern about these cameras is battery life. Some cameras only have a battery life of two hours, and it is possible that the cameras may not always be usable when police officers need them most. If an officer is tasked with turning the camera on and off throughout his/her shift, it may not always be feasible in emergency situations (which is typically when video footage of the incident would be most beneficial in investigations). Furthermore, the majority of support for police-worn cameras has come from politicians and executives of companies that have a vested economic interest in this market. Time magazine published a long commentary regarding it’s support for the use of body-worn cameras, however most of the information of the article was cited back to the CEO of VIEVU, one of the largest wearable body-worn camera makers in the world (Gillespie, 2014). 1. To date, there’s a relatively small amount of empirical evidence to demonstrate that body-worn cameras improve police-civilian interactions. The first randomized controlled trial using body-worn-cameras was conducted in 2013 in Rialto, California, across a 12 month time frame. The study focused specifically on use-of-force and citizens’ complaints, which were hypothesized to be affected by officers wearing cameras, given the possible deterrent effect of the devices on noncompliant behaviour (Ariel, Farra & Sutherland, 2014, p2). The research found a 50 percent reduction in the number of use-of-force incidents among officers wearing the cameras. 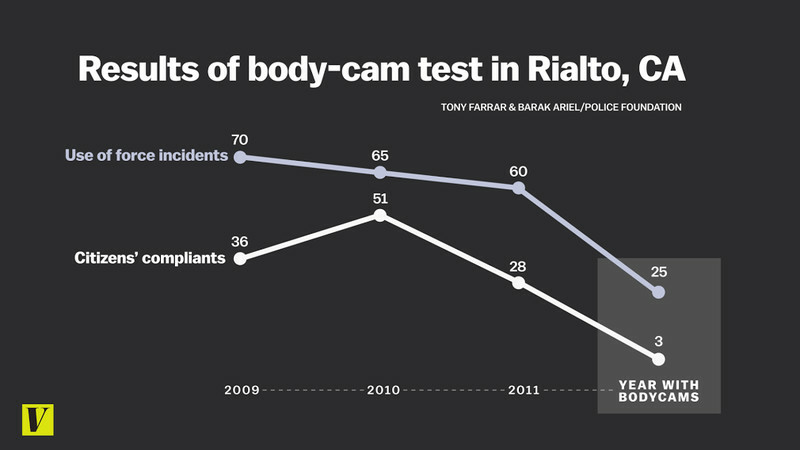 Civilian complaints against police officers also dropped sharply, however the Rialto police department already generates minimal complaints in a typical year, so it’s difficult to draw conclusions. This study has been used as “evidence” for advocates of body cameras to the point of exhaustion. However, this is but one experiment and before this policy is considered more widely, police forces, governments and researchers should invest further time and effort in validating these findings with other research. 2. At this point, body-worn cameras are merely a part of politics. The vocal proponents of body cameras are mainly politicians, police chiefs and executives of body-camera companies. These groups require public approval and support to function, and because police accountability is a “hot topic” currently, advocating for body cameras on officers is simply being used as a public approval tactic. There is no consensus amongst researchers, the public nor police officers in regards to the approval or disapproval of such cameras because no sound evidence has been made available. The only individuals and institutions adamantly pushing for these cameras are individuals who are attempting to capitalize on the emotional topic of police accountability. Before billions of dollars are globally invested by governments and law enforcement agencies, an impartial research study must be performed, one that is not funded by any parties that have an economic interest in the results. Although the outcry for the use of body cameras has been extensively perpetuated by high profile police shootings, the public and state must come to a decision that is well-informed, and proves to be a decision for the greater good of the public and police agencies. A full impact assessment on the use of body-worn cameras must be conducted before adopting the use of them into police agencies. Due to the two themes outline above, I cannot support the implementation of body-worn cameras on police officers. It would be irresponsible for myself, as a member of the academic community, to form an opinion without valid and reliable research to consider. For now, the state and law enforcement agencies should not economically invest in purchasing and implementing expensive programs without a more definitive and clear idea about the effectiveness of such cameras. Ariel, B,. Farrar, W. A,. and Sutherland, A. (2014). The effect of police body-worn cameras on use of force and citizens’ complaints against the police: A randomized controlled trial. Journal of Quantitative Criminology. Obama calls for police body cameras after Ferguson shooting. Dec 1, 2014. The Associated Press. In the new generation of police visibility, the ones under the microscope must look at a means to defend themselves from the implications social media can have over an interaction with the public. To combat police abuse of power and false claims against them, some organizations have implemented body cameras to be worn during an officer’s shift, and record interactions with the public. This specialized technology marks the second of its kind after the police dashboard cams were introduced. Body camera technology provides the public with an accountability reform for police officers who step out of line, but also allows the officer to have concrete backup in demanding situations. Tazer, a company that produces stun guns also developed a new age camera called the Axon Flex. This camera allows for what they call a “full shift buffer” meaning this camera allows for a full 12+ hours of recording. Tazer also offers a secure data store network that can be used to safely store any evidence that needs to be protected. General cost of the cameras is $599 and $15 dollars a month for their secure data storage. Usually attached the lapel of an officer the Axon Flex is also designed to be fixed to a pair of glasses, and both large and smaller utility belts. While Tazer is not the only company that makes this sort of device they are currently the only ones offering a wide angle view. This wide angle view is advertised as being able to capture more than any other camera out there. The purpose of these body cameras is to improve transparency while also being able to hold both parties accountable for their actions. For body cameras to have the greatest impact is to make sure that police are not able to “edit on the fly”. Meaning that the officer is not able to chose when to record and when not to (Stanley, 2013). (Stanley, 2013) says, “If police are free to turn the cameras on and off as they please, the cameras’ role in providing a check and balance against police power will shrink and they will no longer become a net benefit.” Also, police must insure that these devices do not impinge on a person’s right to privacy. This means a few things such as, the police must inform the person’s they are recording that they are in fact doing so, they must not record in a home unless it is an emergency, and recordings must be accessible to all parities pending an investigation. (Jones, 2015). In this new age of media frenzied individuals it only seems fit that police must evolve their tactics to fit the needs of the world today. Police abuse of power has long been talked about, but with no actual evidence against them the word of an officer is held in high regard compared to that of a civilian during any formal complaint. 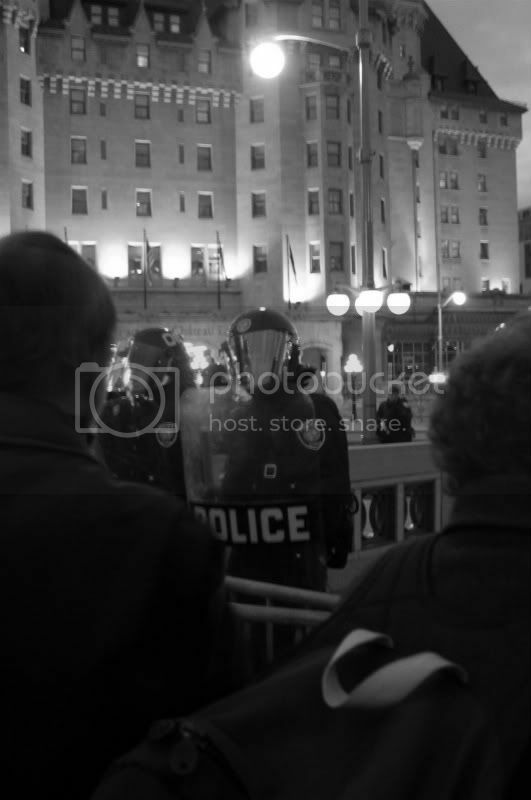 Certain events such as that of Rodney King, Robert Dziekanski, and the death in Ian Tomlinson at the G20 summit in London have been just a few circumstances that have put the police on blast in the media. (Goldsmith, 2010) talks about how the Rodney King incident was the first of its kind to shock the world with police brutality in an “unpredicted manner”. Because of this explosion in social media and almost everything being recorded, police are virtually forced into the need for body cameras. Police body cameras not only help to defend the public, but also aid the officer. In early December President Barack Obama announced that he will be funding $263 million dollars for police worn body cameras. This means they would be able to purchase ~50,000 cameras for officers. The president of the United States is not the only body who feels the need for police body cameras is high. Civil liberty organizations such as Advocates for people with addictions and mental illnesses and even the Ottawa Police Association feel that body-worn cameras will boost transparency by forcing police officers to be more self-aware about using force against vulnerable individuals. The most common thought reported about the videos of police reported to Youtube is that “those videos do not tell the full story” (CBC, 2012). If more police worn body cameras were introduced this would help reduce the rate of frivolous complaints. On the other side of the coin we must consider the negative implications body cameras can create. Having your every move and every word you say recorded can be very stressful on and individual, especially when your job is one of the hardest there is. 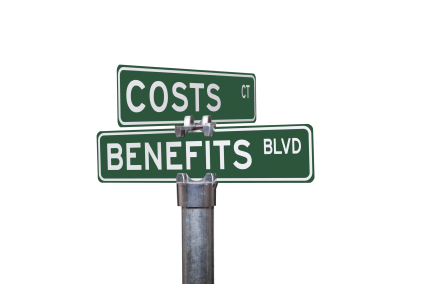 Some potential drawbacks officers discussed are that it could harm their work production. Because many officers deal with confidential informants they are worried that with a body camera recording, these people will not want to engage with the officers anymore, and in turn this will reduce productivity (Lopez, 2015). Another problem police officers see with this is the “big brother” effect. This is caused because the officers feel they are always being watched. Officers are worried that the footage may be used against them in terms of “petty or political problems” (Lopez, 2015). With that being said about the officers the everyday public also has some concerns of their own. Some are worried that they are going to have their privacy impinged upon. This would include being filmed every second that an officer is around. To take that point further when an officer arrives at your home which is a public place they are worried about being recorded in what is your own private space (Stanley, 2013). All of these are valid points which need to be controlled for with some serious policy negotiation. In my personal opinion I believe police worn body cameras can be a positive for everyone if they are implemented properly. They have the potential to reduce use of force complaints and offer a visual to go with a story. Body cameras will give a clearer picture if used properly and can even (fingers crossed) help mold a better reputation in the public’s eye of these organizations. To combat some of the officers concerns with the camera being on continuously we need to allow them the control to know when to activate the device. We trust these men and women to protect and serve our cities, so why not trust them to turn on a camera? In the future I believe the body camera will become as much a part of the utility belt as a pair of handcuffs is today. Cameras also offering a higher accountability reform for police officers. If they know they are being recorded they are more likely to act by the book and stick to policies. With technology changing every day, so must the police. Body cameras are a possible solution to numerous problems, and like anything they have a set of issues them self. These may not be the solution to everything but they are a start in the right direction. Offering better transparency and a higher form of accountability in terms of abuse of power, body cameras have many benefits. It’s not a question of if cameras will be implemented, but when. Goldsmith, A. J. (2010). Policings New Visibility. Brit. J. Criminol , 914-934. Stanley, J. (2013, October). Police Body-Mounted Cameras:. 1-6. My impression of the representation of the G20 summit was that it did not in fact show most of the cover-up done by the police as well as the laws at the time it took place. Overall my impression was that the Fifth Estate did a good job at projecting all sides of the story, from the police deviance (attacking individuals from behind, giving the order to have the dog attack a person, not wearing name tags to be unidentifiable, using smoke bombs on unsuspecting individuals ,etc), to the small groups of individuals who did damage police cars and buildings as well as the individuals who were detained and beaten by officers for no reason. As for the issues arising, I believe the issues will be more faced in the direction of the police from its citizens of Toronto and across the country. After seeing the video, I was extremely angered mainly at the fact that the police were able to detain people well over the 24 hour limit, as well as deny them legal counsel and basic necessities (food, water, etc) as shown in the video. I was also extremely angered that there were well over 1100 people detained and only 98 charged with 12 pleading guilty. It showed that the police used additional force and power when not entitled to. Also, another issue that I found upsetting was that at the time the video was made, only 1 officer had been charged. There were hundred of officers breaking the law and more importantly causing bodily harm. The real issues arising will be the public’s lack of trust in its police force and how to proceed with the trust broken. The police deviance and accountability depicted, I noticed that even after the video of officers using excessive force was shown to the Bill Blair, the police Commissioner, his reaction did not differ as one would suspect. With regards to the accountability, I feel that no matter what the officers would receive, as some only received docked pay and others a few days suspended, it is not enough since clearly damaging a few individuals’ physical capabilities and more importantly their psyche. The trust that is placed in the police is most definitely broken even in myself. After hearing what occurred and talking with friends that went to the summit and seeing it now, it brings back many emotions even though I was not there. Regarding the title, “you should have stayed at home”, as said in the documentary “I find it offensive”, I too do find it offensive. The implications of making that statement suggest that the individuals that were detained due to being on a mission to cause trouble or make a statement when in fact most weren’t aware of what was actually occurring and were more curious at seeing a large peaceful protest.